This is a truly unique piece of memorabilia for any baseball fan. 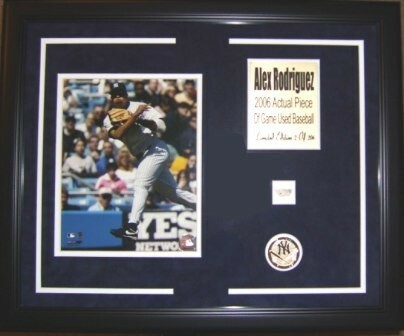 This 8x10 photo of Alex Rodriguez has been professionally framed by Collectibles of the Game. Included in the frame is an authentic piece of game used baseball that was used in a game between the Mets & Yankees on July 1, 2006 at Yankee Stadium. Also framed in this beautiful suede mat is an officially licensed team coin and descriptive plate. The piece is individually numbered as part of a limited edition. This will make a wonderful addition to any New York fan's collection!